I bought Raw Power on cassette while still at High School (25+ years ago!!) and ever since its remained a firm favourite. From the combustible opening of the 100% classic that is Search And Destroy through to the howling, closing throes of Death Trip its a relentless, sneering piece of trailblazing pre-Punk perfection. I never expected to see a coffee-table style book about IGGY POP, let alone about that specific album, but this impressive tome from Palazzo Editions is exactly that. 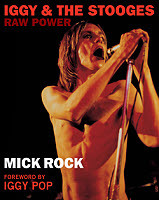 Mick Rock is the man who took the iconic photo of Iggy Pop, live at Londons Scala Theatre, for the front of the album. He was also at hand to capture the band backstage, recording the album and at down-time between sessions. In this book, Rock presents his photos - both black and white and colour - with an impressive, artistic aesthetic that mixes full-page shots, double-page spreads, solitary monochrome images placed on an entirely black page, multi-shot pages, collages and close-up portraits of each band member. Additional to the imagery are a few pages of text, taken from interviews Rock did with the band in 1972 prior to the recording of the album. Key phrases from these interviews are highlighted on dramatic, high-contrasting graphic art pages. The photos themselves have a life, vibrancy and a potency to match the aural ferocity of the album. They are all sharply focused and impeccably reproduced on high-quality gloss pages. It should be remembered these photos were taken long before the advent of digital photography; Rock didnt have the safeguard that allowed him to check each shot after taking it. The fact so many high quality shots are here says a great deal about Rocks ability as a photographer. The live shots in particular (as per the album cover) have a frightening intensity about them, with Iggy adorned in silver pants and silver hair. Its the shots of him in the audience that really captivate - a seated audience that looks both bemused and enthralled. Its hard to imagine what the visual and sonic impact must have been on a musical climate in London 1972; the sonic boom of the band coupled with the androgynous, confrontational frontman must have been sensory overload for many. The posed photos, while lacking the full-frontal bravado of the live shots, display a band as equally intimidating as the live photos suggest, but with an air of hedonistic decadence about them while Iggy appears both openly provocative and coyly diffident. The albums original producer, David Bowie, gets his face in a few pics, as does Lou Reed. This isnt strictly a new book; the original volume was published over ten years ago but here, Rock has redesigned the book, added photos and made something really rather special. As an additional stamp of authenticity, Iggy Pop himself writes the foreword.